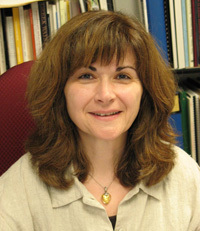 Maria Pantelia is Professor of Classics and TLG Director. She holds degrees in Classical Philology and Linguistics from the University of Athens (B.A), and the Ohio State University (M.A., Ph.D). She joined the University of California, Irvine in 1996 as the second Director in the history of the TLG. Prior to coming to UCI, she taught Classics at the Ohio State University and the University of New Hampshire where she was recognized as an innovator in instructional technology. Under her direction, the TLG underwent a major transformation. The scope of the project was expanded to include Byzantine and Modern Greek, and the corpus tripled in size. In 1999 the project migrated from the original Ibycus system and developed its first CD ROM produced entirely in house (TLG E). New digitization technologies were introduced and a powerful search engine was developed. The entire collection was brought online in 2001. Maria Pantelia implemented a successful business model and built an endowment that has made the TLG a paradigm of sustainability in digital humanities. In addition to directing the TLG, Maria Pantelia has served three terms as Chair of Classics. In 2009 she established the TLG as the Examination Center for the Certificate of Attainment in Greek in Southern California. She has received numerous academic awards, including the national award for Excellence in the Teaching of Classics (1996). The Greek American community has also recognized her contributions with the 2003 Academy of Achievement Award (2003) and more recently the Theodore Salutos Award (2014). Lynette joined the TLG is 2016. She came to us from the UCI School of Social Ecology where she served as the Department Operations Coordinator in the Department of Criminology, Law and Society for five years. She holds a degree in History from St. Xavier's College (Bombay University). Lynette is responsible for overall management support of all TLG business activities including front office operations and functions, management of world-wide distribution of TLG data and day-to-day financial management of the project. John Salatas joined the TLG in 2012 as an Information Technology Specialist. He holds a B.S. and MS in Computer Science from the Hellenic Open University. His interests include Java programming, natural language processing and artificial intelligence. He is responsible for back-end programming, database management, and systems administration. In his spare time he enjoys photography and traveling. Regina Loehr joined the TLG in August 2018. She completed her Ph.D. in Classics in June 2017 at the University of California, Santa Barbara, where she also received her M.A., and she received her B.A. in Classics at Truman State University in Kirksville, Missouri. She pursues research in ancient historiography. During her graduate studies she served as the Fowler Merle-Smith Fellow in the Regular Program at the American School of Classical Studies at Athens. Prior to her appointment, Regina served as Visiting Assistant Professor in Classics at Furman University in Greenville, South Carolina. 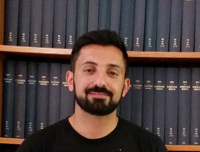 Elias Petrou joined the TLG in August 2017 after he completed his Ph.D. in Byzantine History at the University of Ioannina, Greece. He received his M.A. from Royal Holloway-University of London and he pursued research on Byzantine manuscripts in the Biblioteca Apostolica Vaticana, Biblioteca Nazionale Marciana and Austrian National Library. Prior to his appointment, Elias worked as associate researcher at the Institute for Byzantine and Modern Greek Studies - University of Vienna.